Posted on Monday, July 6th, 2015 at 11:11 am. Ahhh yes, Shilin Night Market (士林夜市). Among my friends, it’s probably one of the most frequently recommended destinations for anyone visiting Taipei. And definitely for good reason too. Despite the crowded alleyways that seem like huge labyrinths for people like me unfamiliar with the area, it’s enjoyable to seemingly get lost among the hundreds of stores and vendors that line the market, selling everything from your favorite Taiwanese street food, to small collectibles, to knockoff luxury goods. I was lucky that Amy, one of my friends from school, decided to come along with me and help lead the way. Without her help, I definitely would not have wandered as far into the market as we did that night. At first, the two of us just wandered around for a few minutes as I took in the sights, sounds and smells of the market. Even though my last Taiwan trip was over nine years ago, I clearly remember significantly fewer people on the streets at Shilin. Now, it was like trying to navigate a packed MRT during rush hour; no matter how hard you try you’re going to run into someone. And after a few minutes of trying to avoid tripping dozens of people, we stumbled upon potato twists (馬鈴薯串). I had heard about these lovely creations through my friends who had gone to the 626 Night Markets in the Los Angeles and raved to me about them. So I decided to give them a try this time. As I waited in line, I struggled to read the different flavors you could get. Unfortunately for me, my Chinese reading skills are not particularly great, so Amy had to help me. They ranged from your typical salt and pepper, to some more crazy ones like octopus. 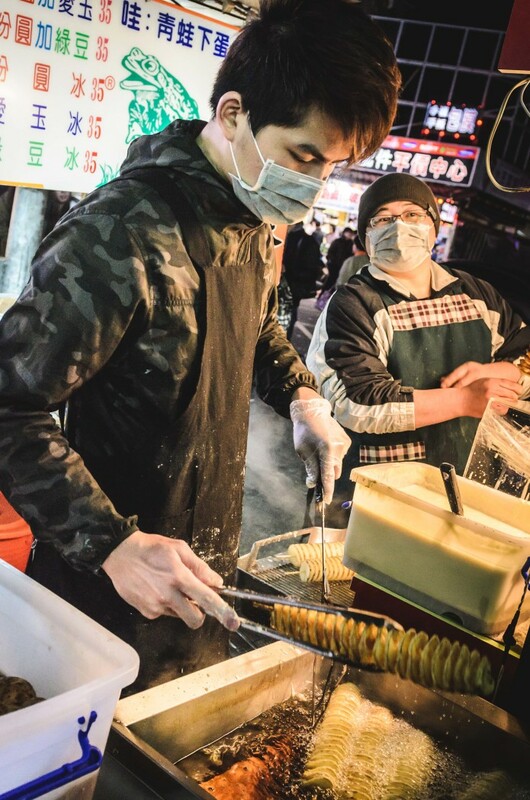 Even though the stall was surrounded by dozens of eager customers and stuck right next to Wenlin Road, amid the chatter and bustle of the market, I could hear the sizzling and pop of the frying oil each time the street vendor dipped in a fresh twist of potato in. As we waited in line, the smell of the frying potato wafted in between those ahead of us and eventually hit us. It didn’t help that we hadn’t eaten much earlier in the day. We were basically dying to get our hands on the potato twists that we had heard so many great things about. And during the wait, I decided to snap this photo. If you look closely at the bottom right, you can see droplets of oil fizzling in the pot as the vendor lifts up a freshly fried twist, ready for the next lucky customer. Bits of starch dotted his apron after working there the entire night and his coworker looked on, ready to accept the next order and satisfy yet another customer. The glow of a small light hanging from the cart provided just enough light for the two to work in tandem together. And in the background, the signs of another store light up the streets as dozens of other visitors walk the streets. I’ve been to night markets in the Los Angeles region and the simply don’t have the life and vibrance that you find at Shilin and other Taiwanese night markets. Part of that’s due to the close knit nature of Taiwanese society that you simply don’t find here in the States. And while, yes many cities over here have their own little farmers markets and festivals, none of them can match the scale and character of those in Taiwan. Benjamin Dunn never leaves home without a camera. Whether it’s a short trip to the market, a coffee break from work or just a food adventure with friends, he always has it ready for whatever situation may arise. It’s a trend that started back in high school, when Dunn picked up photography through his journalism classes. Ever since, it’s become an integral part of his life and one of his greatest hobbies. He shoots a wide variety of subjects, from portrait photography, to PAC-12 sporting events, and concerts with names like Phantogram and New Politics. A love for storytelling and photojournalism has taken him onto 110 freeway in Los Angeles, where he documented Angelenos reactions to the Ferguson situation, and was shot at by LAPD officers. And Dunn has spent time at Skid Row, one of the densest homeless neighborhoods in the United States, to share the stories of those without a voice. His work has been featured with the Daily Beast, Mashable, NBC Los Angeles and the European Pressphoto Agency. He has also won awards at the Los Angeles Press Club. Dunn is currently pursuing a bachelor’s degree in Print/Digital Journalism as well as a double minor in Web Development and Graphic Design at the University of Southern California. He hopes to combine his passion for storytelling, coding and graphics to work on interactive web graphics and change how we receive our information in the future. In his rare bits of free time, he enjoys spending time on YouTube, discovering new boba shops, exploring Los Angeles’ public transit systems and eating 排骨飯 . Visit Benjamin Dunn’s WEBSITE and FACEBOOK.